Chef Rich Mead’s cooking makes this a top pick for contemporary cuisine in Orange County. : What makes chef-owner Rich Mead’s establishment one of OC’s best contemporary restaurants is the consistently first-rate dishes. Each preparation has just the right California twist on a classic old-world favorite. Chef Mead’s insistence on driving for hours to hand-pick ingredients at the Santa Monica’s farmers market also brings flavor and passion to each selection. 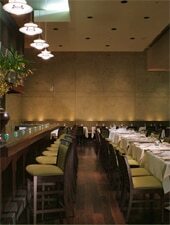 Regulars choose to sit in the modern dining room with ocean views, high ceilings and metallic sage green chairs. Those who prefer the garden terrace are in for a treat as this intimate space has circular tables that facilitate conversation, along with a roaring fireplace and greenery galore. Try Mead’s signature appetizers, especially the light calamari with two dipping sauces and the fall-apart, sweet-and-sour Asian short ribs. Entrées follow the seasons, with such winners as tender scallops atop English pea purée and prosciutto in a Pinot jus or a crisp yet tender seared duck breast alongside wild rice with currants, pine nuts, green beans, beets and a tangy balsamic reduction. Desserts here are well crafted and tend to be lighter than most après-dinner fare. Sunday’s à la carte brunch has a loyal following, so make reservations. The wine cellar is stocked with decent picks but ask for the reserve wine list if you feel like splurging on the best. The three-course tasting menu changes every week and, even paired with wines, it won't break the bank.